What kind of day are you having? Are you motivated and full of life with extra patience to spare? Or are you running on fumes and in need of some strength? Me? I'm in the latter category today...I woke up to freezing temperatures in a messy house with bickering children and an impossible to-do list. Sadly, "woe is me" was my first thought as my feet hit the floor. After a stressful morning, I called an early afternoon meeting and told my kids we were going to use a do-over. Do-overs are fantastic!, at any moment you can begin again. If you snap at someone or overreact inappropriately, you simply need to proclaim "DO-OVER!" and go back to the moment you derailed. The humor helps to diffuse the situation and everyone appreciates being forgiven...and having the opportunity to give forgiveness. It's a win-win! And so, we all said good morning once again, pretending we just woke up. 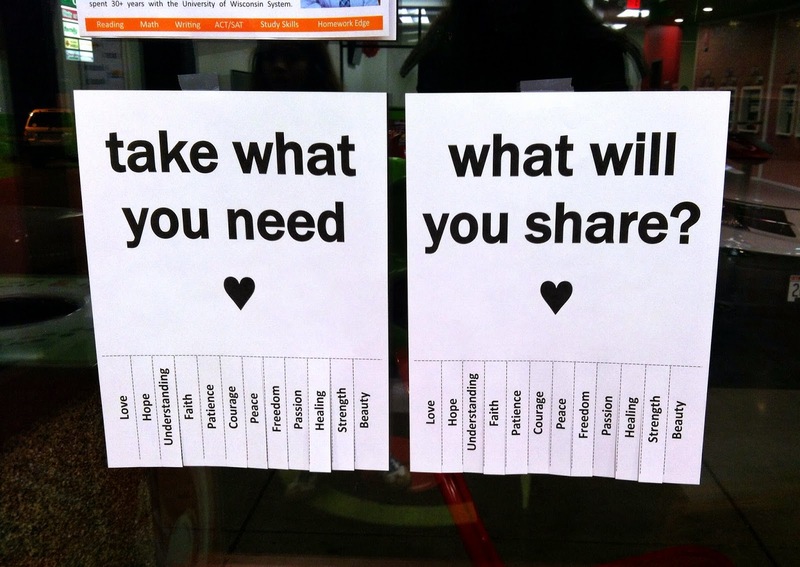 And that's when I told my kids this week's Kindness Countdown activity: Peppering our community with give and take flyers! 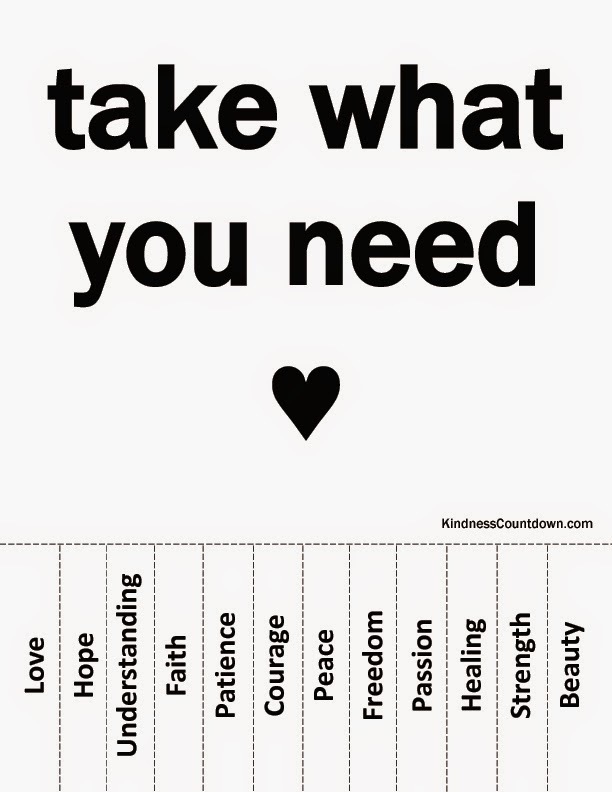 I came across this Take What You Need photo on Pinterest and thought it was spectacular! I imagine I would have felt my load lighten if I had come across the flyer when feeling down and out and blue. 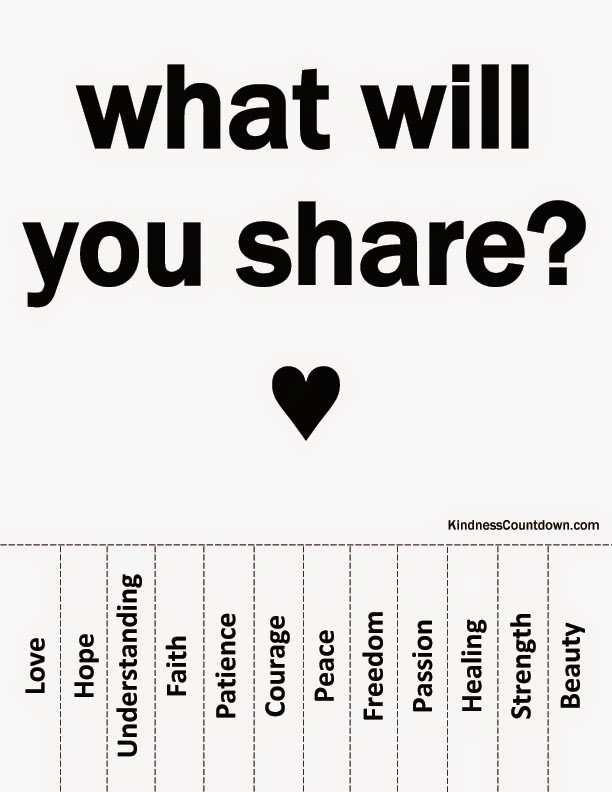 And then I thought about how nice it would be to have a similar What Will You Share? 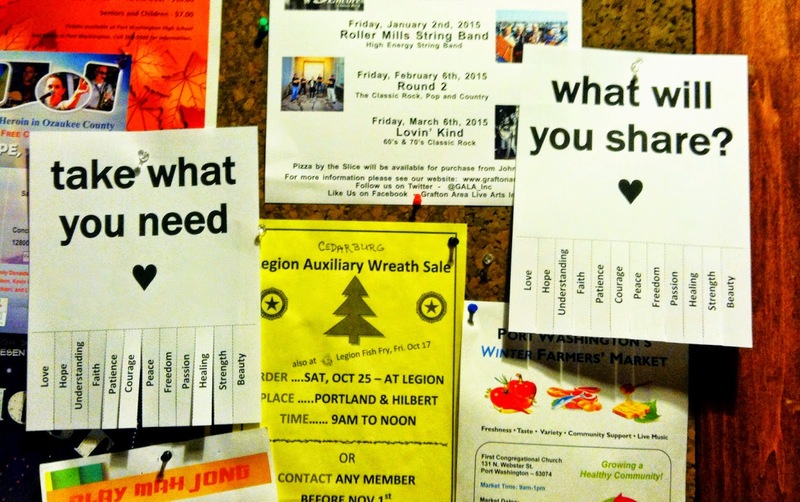 flyer hung next to it prompting people to share those gifts with others. 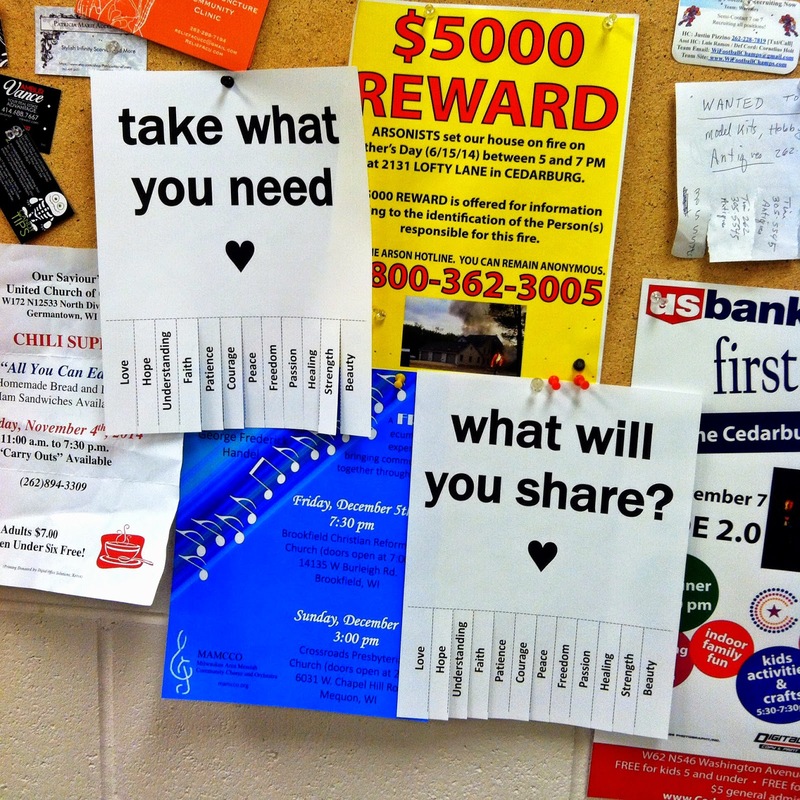 And so I created the flyers and we posted them around town. I'm happy to report we received nothing but positive responses from the other locations we visited. Some store owners even insisted we hang our signs in prime, visible locations. 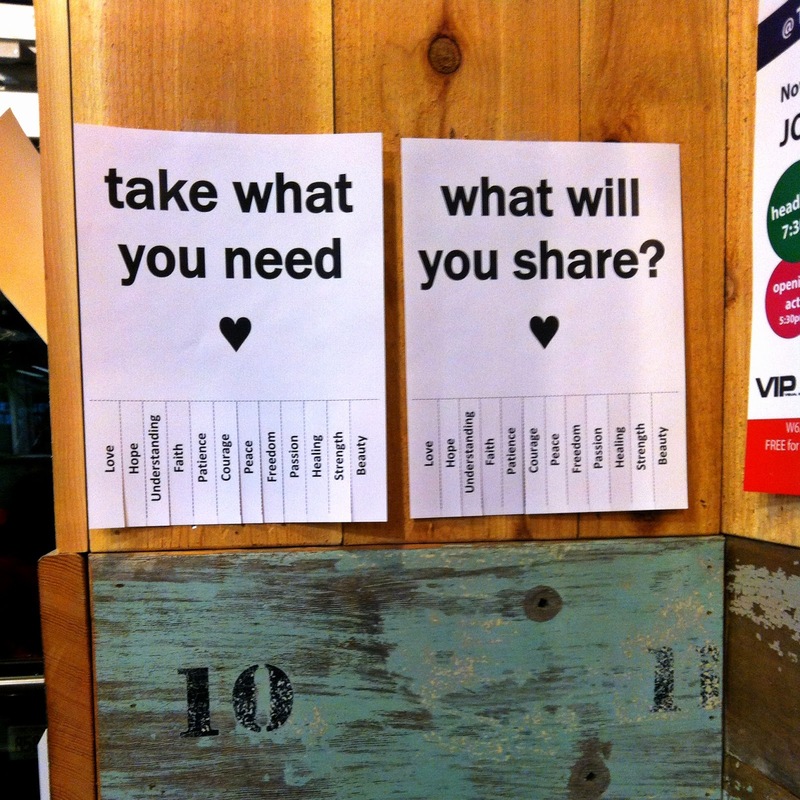 I hope people will notice the flyers and smile, or if they desire, tear the gift they need most in that moment (or the compassion they wish to share with the world) and use it as a bookmark, tuck it in their wallet, or stick it on their computer screen as a reminder that someone somewhere care. And I hope the give and take turns their day around...I know it did mine!